Welcome to the U.N. Mr. Ambassador! It seems I may have spared myself from stepping into a steaming pile of cinematic failure last weekend by being unable to attend a showing of Texas Chainsaw 3D. By extension, I avoided writing yet another review of yet another apparently lackluster sequel to one of the most beleaguered and inconsistent franchises in horror. Good. If I feel differently after viewing the film myself, I'll gladly post a retraction. I do have a history of championing movies everyone else loathes. I simply can't believe that anyone intentionally makes a bad movie, even if the movie's genesis is commercially driven. I have, however, had the Chainsaw movies on the brain this week. I've also been fascinated recently by the fact that Movies At Dog Farm has been getting hits from foreign countries, something that it just never occurred to me might happen when I launched this blog on Thanksgiving day, 2012. 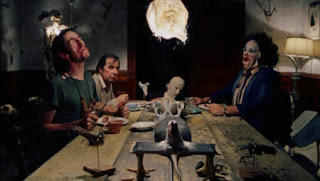 The two seemingly disparate topics have been marinating in my brainpan together, and I arrived at the following conclusion: director Tobe Hooper's The Texas Chainsaw Massacre (1974) is the most uniquely American franchise spawning horror movie around. The United States is a big country. I believe the U.S. is still imagined by much of the world beyond our borders as a Wild West free-for-all that tolerates - and even encourages - an egocentric and often violently destructive self-sufficiency for the individual. In particular, I suspect that to much of the world the great state of Texas epitomizes the U.S. as a whole. It's perceived as a vast, lawless frontier populated by loud, arrogant, gun-toting, giant-belt-buckle-wearing blowhards with cowboy hats. This is an erroneous stereotype, of course - so please, no hate mail - but one that our history, media, and (let's be honest) our interaction with other countries often reinforces. 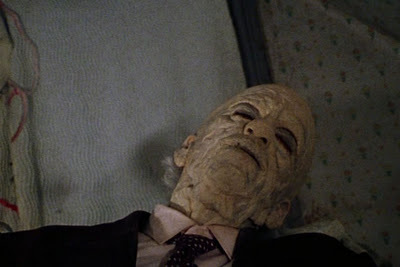 Consider for a moment the character of Grandpa (John Dugan) in The Texas Chainsaw Massacre as a symbolic representation of the United States. 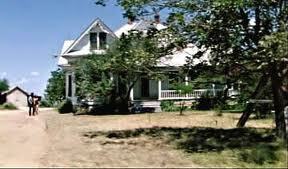 Grandpa use to be the best killer in the slaughterhouse, and the entire Sawyer family delusionally believes he still is. They're determined to keep alive the memories of past glories, and they still revere the last remaining symbolic vestige of their former preeminence - a symbol now old, frail, and almost comically unable to swing a hammer. He perks up when he gets a taste of blood, though . . . 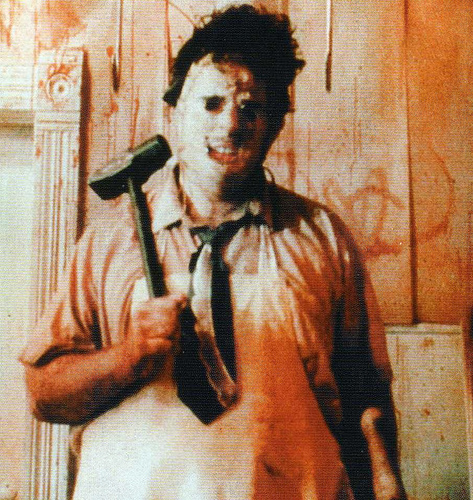 Consider, also, how the character of The Cook (Jim Siedow) is more concerned with the inconvenience of replacing a chainsawed door than with the wholesale slaughter that's been occurring in his home all day. The slaughterhouse is closed, and the gas station has no gas. The Sawyers are doing what they feel they must to survive. The entire family's actions are based upon a flawed morality that suggests that because they're doing what they must to get by that it's kinda sorta O.K. What else should they be expected to do, though, when interloping outsiders keep encroaching on their territory? It's interesting to note, however, that the territory the Sawyers perceive as their own appears to be theirs only by virtue of the fact that they're squatting on it, and the outside world is too indifferent or oblivious to force them out. They've staked their claim, taken something that wasn't theirs, and then fiercely defended their "ownership" of what they've taken against all comers. 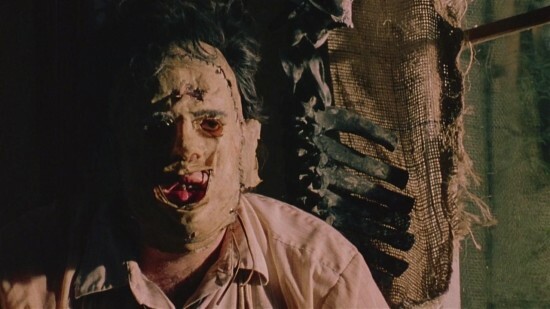 Perhaps only Leatherface (Gunnar Hansen) himself might be absolved of his trespasses, because he seems to be the only member of the Sawyer clan who displays any anxiety or remorse about what he's doing, and he's too simple to know any better. He's defending the family's home and doing his part to provide for their needs. He's following orders. He's but one microscopic cog in an infernal machine that leaves death and destruction in its wake, and all he's trying to do is get dinner ready.
. . . and really, what's more uniquely American than the whole family joining together at the dinner table for some quality time? American Gothic at it's most honest. One, the notion of Texas representing America. This is absolutely true, and I refer back to Bram Stoker's Dracula. Quincy Morris, the gun slinging Texan, embodied all the American ideals that fascinated the author. So using that as a previous example, I can fully understand your argument there. Two, you made the observation that the Sawyer family refuses to give up past glories. This is essentially post reconstruction South ideals. Look at William Faulkner and his writings to see characters that refuse to relinquish old victories. You present an excellent context for it in TCM that satirizes such characters and makes them the ghoulish remnants of the macabre. Than you for this reflection. I enjoyed the article. Now I want to rewatch the movie because I will be seeing it in a whole new light. You have no idea how flattered I am that you want to rewatch a movie (one I'm sure you've seen multiple times) because of this post. John Kenneth Muir is one of my favorite genre writers (see Other Dogs Barking in the sidebar), and one of the things I like most about his writing is that he often presents a unique (and valid) analysis of movies I've seen repeatedly that makes me want to watch them again. That's something I aspire to. I appreciate the encouragement. I enjoyed this piece too.. I so need to see this again... keeping it in the family... did that issue we talked about surface? We also found the movie hilarious and gross and disturbing. Leatherface somehow becoming the woman of the family, getting shoved by into the kitchen, sad but still funny. Damn I love that movie, differently with each viewing. Love this review and love your post on coming to terms with TCM3D. Someday when I'm over the pain of being bent over by TC3D I'm going to have to share the scenario that suggested itself to me afterwards. It made what I got even more of a disappointment. Should've seen Django. I'd still like to tackle TCM2, so maybe that would be a good fit for the upcoming Gore-A-Thon. Thanks again for checking out the posts. BTW, I love your idea of one sentence reviews. I've yet to write what I'd really consider a "review", so the idea of keeping reviews short and sweet appeals to me. lol First thing I look for elsewhere, but I don't particularly like writing them. I'm more of an "appreciation" kind of reviewer, so if I don't like it I'm not really interested in spending my time examining it. How many times have you seen this Brandon? hahaha. Or are you just a poli sci major turned horror blogger genius who can make a snap astute political correlation with a seemingly flat out slasher flick? I've said it before, and I'll say it again, I learn every time I dabble in our bloggin world, and yet again I'm taking away much more than what I ever hoped to. I usually watch movies for simple entertainment. If there's too much over analyzing on my part, it's a chore, and morphs the fun into work. But, now you've made me chastise myself and wonder, what have I missed? And I will begin to watch in a different way--to watch the first time for entertainment, and then again, and again, and again, to, well, for lack of a better phrase, get it. Thanks! And congrats on Monster Speaks! Until next time Brandon....keep those fires stoked! You're hot as hell right now. Thanks, Warden. I was thrilled to see your comment on an older post rather than the newest. I sometimes feel like once they fall off the main page they just kind of disappear. Digging up some of the buried bones and dusting them off was the impetus for the new "bone banners" in the sideboard. I wrote the majority of this post during a slow day at work. lol As I mentioned in an earlier comment, I don't really fancy myself a reviewer. It's often more fun for me to find an angle and write from that. I'm flattered any time someone tells me that my angle prompted a reappraisal of the movie.